It’s almost become a mantra for Mexican-food lovers: No matter how many new restaurants in the Burlington area try, they can’t seem to get it exactly right. Many residents have lamented the loss of Tortilla Flat, a den of Tex-Mex comfort eats once located in the building that now houses Bluebird Tavern. (Its nachos are still popular — bevo in Colchester serves a similar dish to eager crowds.) Over in South Burlington, La Carreta, a chain that employed Oaxaca natives making dark, rich moles, closed nearly five years ago. The VFW post in its place still bears its south-of-the-border decorations. If Burlingtonians bemoan the dearth of “authentic” Mexican options, it’s not just because Vermont is on the wrong border. The Mad Taco, with its pig-centric tortas and tacos, is worth the drive to Waitsfield. Johnson’s Hot Tamale brings its aromatic tamales and birria-stuffed wraps to farmers markets from Barre to Winooski. Many Chittenden County locals will travel to Frida’s Taqueria and Grill in Stowe for light, big-flavored food. But when it comes to sitting down in Burlington for a Mexican meal, many diners say they’re unsatisfied, including at Burlington stalwarts Miguel’s on Main and Madera’s Restaurante Mexicano Cantina. This winter, we began to hear rumblings of the arrival of “authentic” Mexican dining. Pierre Mesa, a Colorado transplant, blogged about the West Coast taqueria tour that, he said, would supply him with ideas for his in-the-works restaurant, Don Pedro’s Authentic Mexican Taqueria — now in Winooski. A Mexican American from California named Tree Bertram announced a plan to bring her family recipes to downtown Burlington at El Gato Cantina. With less fanfare, Mi Casita opened in St. Albans. And, in Jeffersonville, El Zorro Mexican Restaurant & Cantina began serving “authentic VerMexican” fare. It looks like we’re finally experiencing a renaissance of Mexican food in northern Vermont. But do the taste buds agree? The Seven Days food team headed to the four newest additions to find out. On the whole, the news is not quite as exciting as we’d hoped. True, most of the new restaurants are pushing authenticity with dishes not previously seen in Vermont. 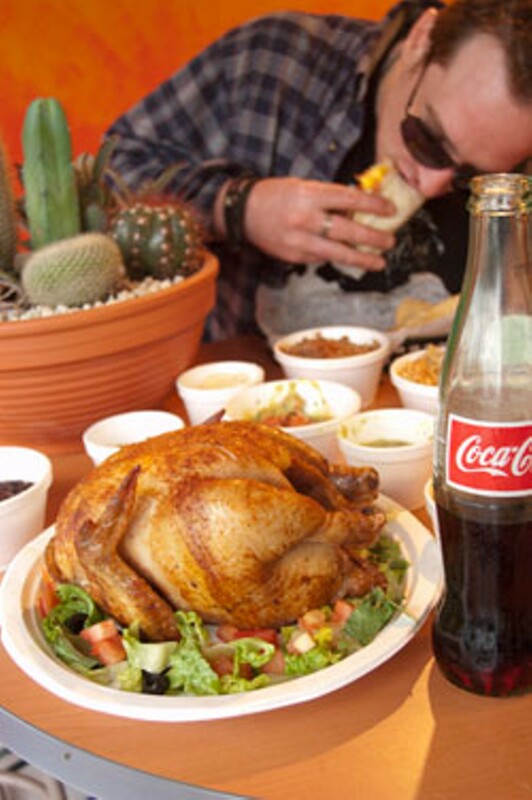 Don Pedro’s spice-rubbed rotisserie chicken is a notable success, for example, but many of the other novelties falter in terms of flavor, freshness or Mexican cred. These restaurants are still in their first months of life and may yet meet Vermonters’ high expectations. We hope so. El Gato Cantina’s arrival on Burlington’s lower Church Street was greeted with nervous expectancy. Burlingtonians have long complained that their burg lacks “real” Mexican fare, and El Gato’s owner, Tree Bertram, promised she would deliver the goods: fresh, authentic Mexican food based on the dishes she learned growing up in central California. Diners (and 7 Nights online commenters) have been sharply divided on whether she succeeded. Some comments ooze passion for El Gato’s fare, while others call the praise nothing but hype. After a few visits, we’ve concluded that Bertram’s kitchen can approximate some of the fare you’ll find south of the border. Other dishes, though, seem overcooked, oversauced or somehow discordant. It’s a wild ride, with both highs and lows. Take the warm tortilla chips that come with every meal. On one day, they might be oil laden and flavorless; on another, feather light and perfectly salted. Ditto for the salsa: Though very fresh and laced with mouth-watering lime and cilantro, it can be watery and bland on one visit, and addictively punchy on another. All of the Tex-Mex standard-bearers are on the menu here, burritos, enchiladas and chile rellenos among them. And the creative flourishes are many. You can order chicken or beef (carne asada) tacos, but also ones filled with beef tongue, or with mushrooms and epazote. El Gato’s fish taco ($3.99 each), which comes with grilled or fried tilapia, is smeared with an unctuous, spicy aioli. (The fried option stands up better to the heat.) When I tried it, the ribbons of slow-braised beef inside the barbacoa taco ($2.99) were rich, tender and mouth filling. But the downside to both tacos was thick, tough, overcooked tortillas. Ceviche can be dreamy, but one offering here ($8.99) was a cold mess, with hunks of gray shrimp floating in an unhappy soup of citrus juices and tiny, hard slivers of avocado. Better were the pork tamales: Smothered in a roasted-red-pepper-and-tomato sauce, their fatty, sweet mash is fun, if messy, to excavate. I first encountered pozole, a soup made with pork and hominy, on a Oaxaca farm where a local family made a batch each week with buckets of fresh milk and huge slabs from their own pigs. It’s a difficult soup to get right, and El Gato’s version ($7.99) — laced with chile and filled with swollen dried corn and tender pork — is fiery and filling. It arrives with tortillas and some raw radish and onion for garnish, but all you really need is a spritz of lime and a handful of cilantro to amplify its charms. 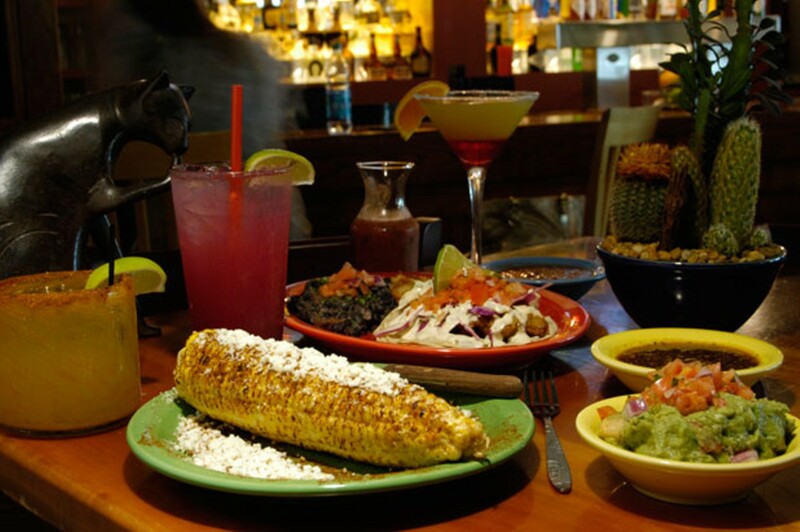 One of the treats here is the elote, or grilled corn ($3.50 per ear), which is rolled in butter, mayonnaise and chile powder, grilled so that it chars in places, and then sprinkled with crumbled cotija anejo, a creamy, tangy, aged cheese. The corn itself could be a little sweeter and fresher, though. In fact, overall, a diner at El Gato might start to wonder if less-than-stellar produce lurks beneath the sauces and seasonings. The star of the show here? Margaritas. El Gato infuses its own tequila in huge, medical-looking jars, and the bartenders take great care in preparing such concoctions as a grapefruit-jalapeño margarita — tart, piquant and immensely satisfying. A Skinny Cat margarita tastes almost as sinful as its higher-calorie cousin. The constants at El Gato, so far, are fabulous drinks and warm service. It’s a festive place to hang out and sample some unique dishes; just be prepared to be surprised, for better or worse. The lines move with admirable speed at Don Pedro’s Authentic Mexican Taqueria. Just moments after I ordered, my large meal was waiting for me on a pair of cafeteria trays; I’ve waited far longer at McDonald’s. But then, with lines sometimes snaking around the block at this fast-casual restaurant, they’d better move. In Don Pedro’s first weeks of life, co-owner Pierre Mesa reported that 550 diners were streaming into his small restaurant each night. Winooski police told him they’d never encountered anything like his crowd-control issues. It’s obvious what attracted the masses: the promise of real, live Mexican food, made fresh each day, at rock-bottom prices. Tacos top out at $3.25 for the traditional fish option. It’s filled with the catch of the day, homemade mango salsa and shredded cabbage, then dressed with mild chipotle crema and stuffed into the diner’s choice of a corn or flour tortilla. On two visits, I found both varieties of tortilla — also made on site — too thick to be pliable. The first one crumbled around my rotisserie al pastor pork taco ($2.95). The next had a better texture, but could still be improved. The larger wrap on my carnitas burrito ($6.25) was softer and more uniform. The tangle of pulled, chile-rubbed pork shoulder therein was also more flavorful and moister than the al pastor. Lightly spiced brown rice and tangy black beans added texture to the comforting wrap. The thin green chile sauce, which the busy brigade of cooks initially forgot, was low on flavor. No such problems with the red sauce on the two-enchilada combo ($8.50). It was dark and complex, with a taste of smoky chiles. I asked for one beef and one chicken and received two beef, but enjoyed them nonetheless. Refried beans on the side lacked the fatty punch they require — next time, I’ll stick to black. The white rice was pleasantly spiced but not as tasty as the healthier brown. Perhaps Don Pedro’s wants to trick us into eating more healthily? That theory is contradicted by what the menu calls a “huge bag of fresh cut and fried corn?chips.” The description is entirely accurate. The giant pile of chips comes on its own ($2.50) or with an order of mild but creamy guacamole ($4.65), served in a greasy brown paper bag. It’s a fun gimmick, and the chips are excellent — warm, fresh and salted just heavily enough. The salsa bar, filled with pickled veggies, jalapeños and more of the mango salsa, among several other homemade dips, is a worthwhile stop when you’re riding the chip train. My favorites were the hot sauce, which was actually more like a cilantro-laden, blended-tomato salsa, and the zesty, smooth avocado salsa, which I preferred to the guacamole. The food at Don Pedro’s is clearly all handcrafted, and at times it suffers for its art, with flavors that are less than fully developed. A notable exception was the ear of corn in chile butter ($1.75), which I immediately craved more of upon finishing it. The day after I dined at Don Pedro’s, the cooks began 24-hour production to ensure that both dinner and lunch food stay up to snuff. Once the kinks are worked out, I may be the first in line for a huge bag of chips. Maybe not yet, though the restaurant gets an A for effort. Until recently, the small but elegant space on Main Street was home to the short-lived Blue Acorn. It has retained the stunning copper bar, but otherwise has been remade into a Mexican fiesta, full of art and knickknacks that suggest to diners they’re not in St. Albans anymore. Mi Casita opened in July, boasting authentic dishes such as pollo mole, barbacoa and birria among its offerings. Said mole ($14.99) was fine, as long as I didn’t think of it as mole. Ideally, I want my mole to taste as dark and earthy as mud and twigs, but this sauce reminded me more of Hershey’s syrup. The chicken leg and thigh it flavored appeared to have been deep-fried into crispness. The sides were odd, too: plain, white rice and a segment of buttered corn. I preferred the more typical Tex-Mex fare I tried at a subsequent lunch. The chefs at Mi Casita aren’t afraid of fire, as is clear from the first bite of the hot salsa. Dark brown and chile laden, it burned my throat for minutes after I swallowed it. I found I liked it best when mixed with the milder, puréed-tomato option. Tacos come as hard tortillas by default, but are also available soft. Tacos de la casa ($6.99) were filled with a Native American combination of corn, zucchini and potato, all sautéed together and lightly spiced. The vegetables were sufficiently flavorful that only the seemingly unseasoned pulled chicken on top detracted from the otherwise handsome taco. Taco sides included yellow rice, a small pile of chopped iceberg lettuce and delicious refried beans. The silken mash tasted rich, but also had an unexpected kick of spice. Luckily, those beans came with the enchiladas ($8.50), too. The three taquito-sized corn wraps were filled with tender beef. The red sauce on top didn’t have an easily identifiable taste, but it was pleasant. The tres leches cake ($4.99) had more personality. As airy as it should be, the pound cake managed to soak up three milk products without seeming soggy. It was intensely sweet and buttery, but didn’t overwhelm my taste buds. If the rest of the menu can rise to the promise of that cake, Mi Casita may live up to its owner’s dreams. What exactly is “VerMexican” food? I pondered this question as I rolled up to El Zorro for the first time. Chef Kasey Longe — formerly of Jeffersonville’s 158 Main — applies that label to his fusion cuisine combining Vermont ingredients with Mexican inflections. Housed in the former Red Fox Alpine Lodge, just north of Smugglers’ Notch, El Zorro resembles a roadhouse — not necessarily a Mexican roadhouse, but a place where you might expect to have a raucous time. And maybe even crash afterward: Upstairs, the inn’s rooms still await. Others must dig the setting’s allure. On two weekday visits here, the spacious dining room was full, despite the brusque service and uneven food. Granted, El Zorro’s starters are intriguing, and offer at least one reason to return. Deciding between a pulled-pork tostada (starter) and a salmon sandwich (entrée); or a shrimp “empanzeno” (starter) and a bar steak (entrée) is really a no-brainer. The creative small-plates menu is where it’s at. Blue-corn-encrusted calamari ($9) is dotted with tiny pepper slivers and feels like eating a cloud of crunch, though it could use more of the gently spicy chipotle crema drizzled around the bottom of the plate. That pulled-pork tostada ($8) is winning, too, a towering tangle of sweet, moist meat topped by a drippy jicama slaw and a sprinkle of fresh cilantro. The lime Caesar salad ($6 for a small portion), lightly dressed in a bright, creamy dressing studded with polenta bread crumbs, is a stroke of delicious simplicity. Other dishes are money wasters, however, such as a chicken tortilla soup ($5) whose meat tastes canned. Grilled fish tacos should ideally be filled with mahi mahi; however, the perpetually glum waitress reported that the kitchen had run out of said fish and was unlikely to get it in again — ever. The tilapia that took its place had an alarming funkiness not easily disguised by an avalanche of jalapeños. Even with the fish downgrade, diners pay $16 for two tacos with rice and beans. Ouch. The cloying, chunky salsa tastes as though it hails from a jar, though the tortilla chips are light, warm, crispy and addictive. Disappointing, as well, is the house margarita, which can best be described as saccharine with a petroleum finish. Better (though weaker) is a fruity, spicy watermelon punch. If diners here stick to dishes that veer from true Mexican cuisine, they can construct a decent meal. Unless El Zorro works on its service, though, diners should be prepared to wait for their chips, their food and their check, and generally feel as if they’re imposing whenever they ask for something. Service at the bar was a bit zippier and friendlier on my visits, however.